Well, we are into our second month of homeschooling this year and all is going well. Sam and Sadie are still promptly coming to the table when I call them. There is very little complaining (although I expect the complaining to increase with time) and we are generally able to get done all of Sam's 2nd grade work either by lunch time or by mid afternoon. One of our highlights has been watching the PBS documentary, The Life of Birds . We are getting it through Netflix. It's divided into three DVDs with each DVD containing several "chapters", or ~ 40 minute sections. These are perfect for short science lessons. It is pairing very nicely with his science book on Exploring Creation, Flying Creatures of the Fifth Day. There is quite a bit of evolution-speak in the very first segment of the documentary, but we got through it fine with some discussion. The footage is amazing and I, um, I mean we, are learning so much. For example, some birds sit on an ant hill and stir it up on purpose so that the ants will come out and crawl all over them. Agitated ants secrete a chemical that drives lice and mites off of the bird. That, my friend, would be enough to send me into a panic attack for certain. For the first time, we are making lapbooks. Sam is making one called An Overview of the 17th Century from Journey to Learning. This ties right in to his history lessons. Being our first lapbook and with me not having a whole lot of extra time on my hands, I bought the complete kit- everything is already printed out and the kit contained the folders as well. 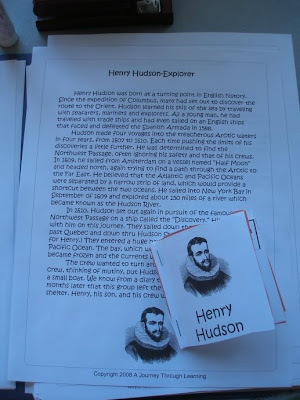 There is a page of reading/history lesson to read first, then a piece to put together to place in the lapbook. We've just gotten started- this is a big one. 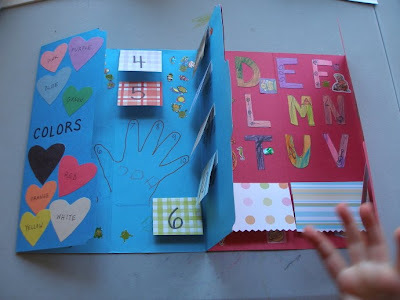 Knowing that Sadie would want a lapbook as well, she and I created a preschool version for her including shapes, colors, the alphabet, numbers, etc. Hers went together fast and we had a lot of fun making it. 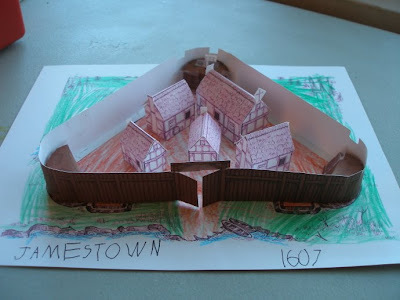 Another highlight this month was making a model of Jamestown. You can find the link at Homeschool In The Woods... here. It is a free download of a total of 5 pages (including instructions and model cut-outs). I had to do a lot of the cutting since the cut-outs were small, but Sam enjoyed coloring them and helping to assemble the settlement...and of course playing with it:-). We've also been enjoying a lot of read-aloud time having to do with history. 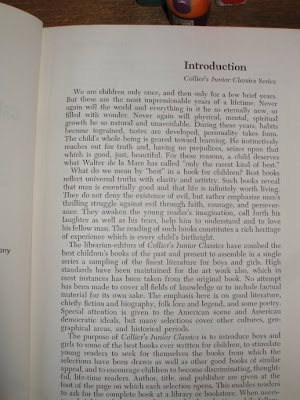 A teacher friend of mine gave us a bunch of books their school library was discarding. 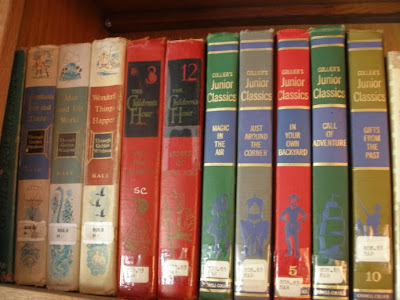 Included were several volumes of Through Golden Windows by Hall, a series published in the 1950's. 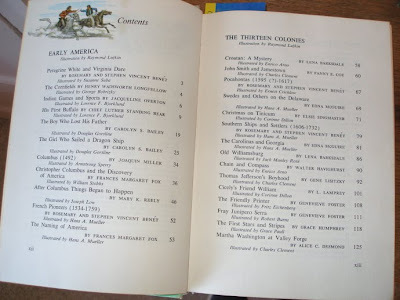 They are full of short stories from excellent authors divided into topics. 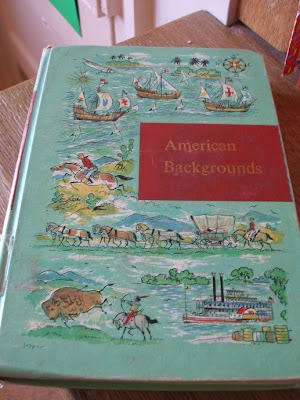 We are currently reading through American Backgrounds. Click on photo to make print larger. 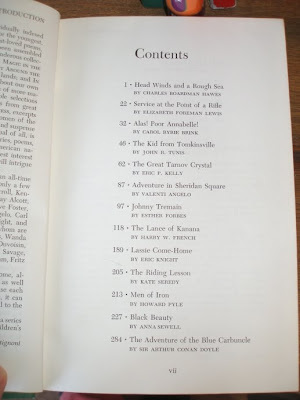 A sample partial table of contents from Collier's Junior Classic's Call of Adventure volume. Oh, you speak to my heart when you talk of good books and learning! I love the Birds series you mentioned. Have you gotten to the part about how their throat works or what they do for plants? (I don't want to be a spoiler, so I'm not mentioning more!). I learned so much from this documentary that glorifies God whether they recognize Him or not! Love the lap books which are also a favorite of mine, especially the preschool lapbook. Great job! It will be interesting years from not to hear what our children remember and love about homeschooling. One thing I am encouraged by... my girls were a bit reluctant to leave the Christian school to homeschool, but now I hear comments that lead me to believe they prefer it. What I REALLY hope is that they develop a love for learning that lasts a lifetime! I've commented before, and this may not be the right post for this one, but I just wanted to say how much I LOVE your recipes! Thank you so much for posting your weekly menu plans; it's gotten to the point where I consult your blog before my own cookbooks and recipes when I'm planning my weekly menus :). This week we had the curry chicken pot pie and the sweet potatoes and bean burritos. SO GOOD!!!! Oh, and the pesto torte was the BEST thing I've ever tasted and has made me quite popular at parties :). Thanks!! 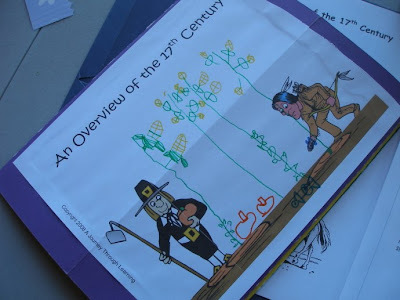 As a homeschooling mum of six I love seeing what other people are doing, we have a couple of the exploring creation series you mentioned, your children's projects are very creative, thank you for sharing.